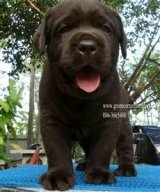 The labrador’s puppies from Green Corner Labrador kennel are available for sale. They were born on April 15th ,2018. All of them are yellow coat. Sir is Bossa ( RUS.TH.CH.STARNEOS FAVORITE ) who is imported from Russia. He is nice and healthy. Bossa has a good structure correctly Labrador's standard and good temperament. He has examination about genetic disease ( HD:B, ED:0, PRA:CLEAR, EIC:CLEAR, HNPK:CLEAR, CNM :CLEAR). Dam is Florence who is an active and clever Labrador. She has a good structure correctly Labrador's standard and good temperament.
" บ้านหรรษาชิวาวา&ฟาร์มกรีนคอร์เนอร์ลาบราดอร สุนัขทุกตัวมีสุขภาพดี ได้รับวัคซีนค มีใบเพ็ด มีการแนะนำการเลี้ยงสุนัข และให้คำปรึกษาปัญหาเกี่ยวกับน้องหมา "